Young medical student, Teo Avelar, is more at home dissecting corpses until one day at a party he catches a glimpse of Clarice. She is bright, exotic and like no other girl he has ever met. They share some small talk and from then on Teo is obsessed. When it looks like Clarice is not going to fall for his charms, in Teo’s warped mind the only thing to do is to kidnap Clarice. Surely after they spend time together she will realize that he’s only had her best interests at heart. 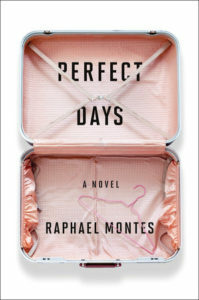 Teo takes Clarice to a remote location so she can spend time writing her screenplay “Perfect Days” in solitude and at the same time getting to know him. He lies to his mother and Clarice’s family and friends. He is frightening in his control methods and his rationale for holding onto Clarice. Part of what makes this story work so well is that it is all told from Teo’s viewpoint. He’s a young man who cares for his disabled mother, a good student, and sure somewhat socially awkward but to see the progress of how he completely rationalizes his mad behavior is frightening. Now this is what a thriller is supposed to be like. It’s full of twists and some gasp-inducing moments. It is interesting to note that this story came about after the writer’s mother encouraged him to write a love story. Well, obsession can be a part of love and there is plenty of that in this novel. This is a terrific book and I highly recommend it. You know, I read a blurb about this book before and wasn’t all that interested in it. However, you’ve made it sound so much better. Putting it on my list. Obsessive love – scary! I’m always a little uneasy at the idea of obsessive control–which make the topic perfect for psychological thrillers. Thanks for the recommendation! Wow, that does sound very frightening! I have seen this author’s books around but not really checked them out. Maybe this one it is. Scary! You could probably count this as a RIP book! I loved this one so much; what a nut!